Have you ever seen giants? Do you have the slightest idea how they looked like? Our parents read to us fairy tale stories when we were young and occasionally see them in movie theaters. But to tell you the truth, I have seen the giants or the higantes. I never actually believed they existed in real life but I realized that they do when I came to visit a town in Angono. Let me tell you the story. It was a sunny afternoon when my family and I came across Balaw-Balaw, a gallery-restaurant that offers exotic foods for the adventurous diners. Owned by the late Lakeshore artist Perdigon Vocalan, this restaurant is becoming popular among foreign and local tourists alike. Diners can wander in the gallery while waiting for their food to be served. Upon entering the restaurant, you will see the “Mag-anak,”-- the family of higantes that consist of the father, mother, and child, looking closely at the people passing by. As I remember, I asked him regarding the higantes. He told me about the annual festival of Angono -- the Higante Festival in honor of St. Clement, the patron saint of the fishermen. This festival is celebrated on the 23rd of November. 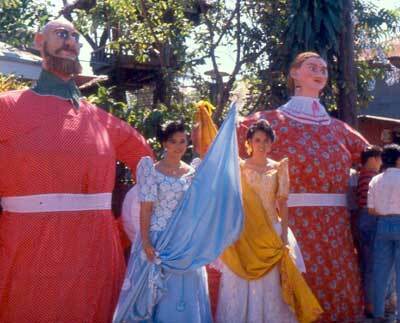 The higantes are made of paper-mache. 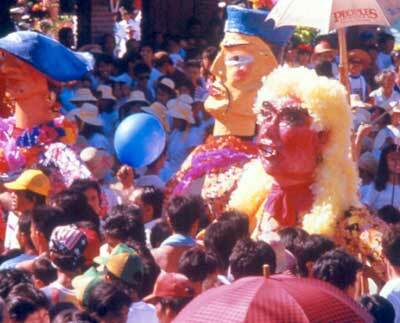 In Mexico, paper- mache is called piñata while our native town in Paete, Laguna calls it taka. Higantes measures four to five feet in diameter and ten to twelve feet in height. Traditionally, it began in the last century when Angono was a Spanish hacienda. This higantes was influenced by the Mexican art form of paper-mache brought by the Spanish priests to the Philippines. They are created larger-than-life caricature of their Spanish landlords. Another story was that of the Frenchman who happened to pass-by the town of Laguna de Bay as he cruised from ManilaBay. The town of Angono being divided by river fascinated him. He predicted that someday giants would emerge and the town will be renowned. It happened as the Frenchman predicted. Angono produced two National Artists -- Carlos “Botong” Francisco in the field of visual arts; and Professor Lucio de San Pedro in the field of music. These higantes were paraded in the town. Two men help each higante walk by controlling it from inside throughout the entire event. The head has two holes for each man to see through. Additional holes are also made on the higante’s clothing to help the two men see beneath. Children are usually afraid of the two higantes (father and mother) but they are fond of the child. These higantes danced, walked, turned, and ran. According to the book entitled Angono Rizal: Art Capital ng Pilipinas by Ligaya G. Tiamson Rubin. It was stated that Karias Tangkad was the one who made the first higante. Perdigon conceived the idea of having a Higante Festival. The thirteen barangays of Angono are represented by higantes symbolizing their personality and industry. With this idea they where given funding by the Department of Tourism and the Provincial Tourism Office. It was really a good start because the following year as seminars and workshop for higante making took place and a competition was put up to award the best higante made. The higante designs developed as time went on. The higantes became a part of Angono. And the story lives on. What are these higantes made of? Do they eat small, naughty children? Do they have the goose that lays golden eggs and the singing harp as told from the story of Jack and the Beanstalk? No, they are different higantes. They are made of paper. Giant heads are fashioned from the mold made of clay, which is dried under the sun’s blazing heat. With the rapid growth of modernization and technology clay changed to plaster of Paris and resin. The mold is pasted with lots of newspapers then split into the middle and sun-dried, after which it is then again pasted with the brown paper or Manila paper then split into the middle and sun-dried. The outside body is painted with different designs or dressed with yards of yards of clothing materials and accessories to complete their costume and the inner body is made of bamboo, rattan and thin iron bars.